In addition to sharing some fantastic Maine eats with you, I also wanted to tell you about some of our favorite activities we did on the recent trip. In Maine, there is no shortage of lighthouses and forts to explore. It makes for some great walking tours. Stunning views of little harbor after little harbor (Camden pictured here). Some views can get even better with height, like using the Mount Battie Trail just outside Camden. Thank you, random stranger, for thinking we looked sweet and captured this moment from behind! We also took an authentic lobster boat ride this year, and got to watch as they harvested lobsters from the traps outside Camden. Thanks, Captain Jack Lobster Boat! Of course, we headed to the 70th Annual Maine Lobster Festival (twice!) for not only the food, but for the carnival games, art/craft tent, rides, and more. I've picked up some great artwork for our home here, and a fun tote bag made from old sails. A highlight of the trip was an unplanned adventure, touring the Glidden Pt. Oyster Farms in Edgecomb. We had stumbled upon their roadside sign on the way to Camden, after just enjoying their oysters at lunch. Thanks to a quick Google search, I learned that you can go to the farm to eat oysters at any time, and schedule your own private tour as well. ...and it left us with huge smiles and forever memories. Don't mind our obnoxious lobster gear, we were headed to the Lobster Festival afterwards, haha. We're now on a mission to find Glidden Pt. Selects (our favorite oyster of theirs) in Cleveland. Euclid Fish Co. in Mentor apparently has them weekly. Lucky for us, Glidden Pt. Farms also sells them online and ships them directly to your house! I see a purchase in our future. ...and by sea, thanks to Portland Discovery Tours. It is a great way to get the lay of the land, and to learn about a city's history. We enjoy getting to know the places we visit, and these activities were a great way to do so this trip. This week will be all about my recent trip to Maine with Mr. H. We are the type to always want to try something new and unfamiliar, seeking new experiences. That's basically how this blog was born! But, there's something about Maine that has drawn us back in for the last three summers. We head to the same area, but always do new activities and try new food...for the most part. Some favorites might make a reappearance! So today I'll be talking about some of the eats we had in and around Camden, ME. First, a wonderful dinner at Francine Bistro (James Beard finalist eight times) on Chestnut Street. We started with some Oysters with Agua Chile and Smoked Trout Crema ($18 for 6). Mr. H deemed these the best oyster dish he'd ever had. He then had a roasted lobster, and I enjoyed a beautiful piece of halibut with a spring pea puree and salmon roe. Each plate was gorgeous, they had an impressive craft cocktail list, and this French bistro was lively and comfortable. The menu changes frequently, as the chef practices "extreme seasonability." The next night, we dined at the 70th Annual Maine Lobster Festival in Rockland. The real reason we've structured our Maine trips around the same week each year. You can sit there and just crack open the soft-shelled lobster with your bare hands. It's a lobster-lover's delight! For our last dinner in Camden, we headed to Natalie's Restaurant at the Camden Harbour Inn on Bayview Street. The fine dining restaurant offers a four-course prix fixe ($89), five-course lobster tasting menu (Market Price), or a seven-course Chef's Tasting ($115). We were all in for the Chef's Tasting (which was actually 10 courses with all the extras they tag on). The dishes were stunning, and showed a lot of technique. There wasn't a bad plate of food in the bunch, and service and the wine pairings matched the quality of the food. The setting was also perfection on this summer evening, perched on a wide outdoor deck with sunset and harbor views in the distance. ...to finish, the food was beautiful and this meal was a memory-maker. As we departed Camden the next day to head to Portland for the remainder of our trip, we had to catch Mine Oyster Restaurant & Raw Bar in Boothbay on the way. We had the opportunity to tour Glidden Pt. Oyster Farm the day before (more on that later this week), and the farmer called the owner of Mine Oyster an "oyster nut" because of his large menu of oysters. It was true, and fun, because you got to just write in how many of the types you wanted on a checklist menu. Our oyster and lobster roll lunch included a great deck on the harbor with classic Maine views and the sea breeze. I was looking forward to Portland for the rest of the trip, but I'm always sad to leave the Camden area. There's still a lot left to explore and we'd love to keep going North, so needless to say...the Homers will be back. Stay tuned this week to hear about some of our favorite Maine activities, and our dining experiences in Portland, ME! With September right around the corner, that means that boots and scarves weather, fires in our fireplace, comfort foods, Cleveland Browns' games, and one of my favorite fall fundraisers are right around the corner too. 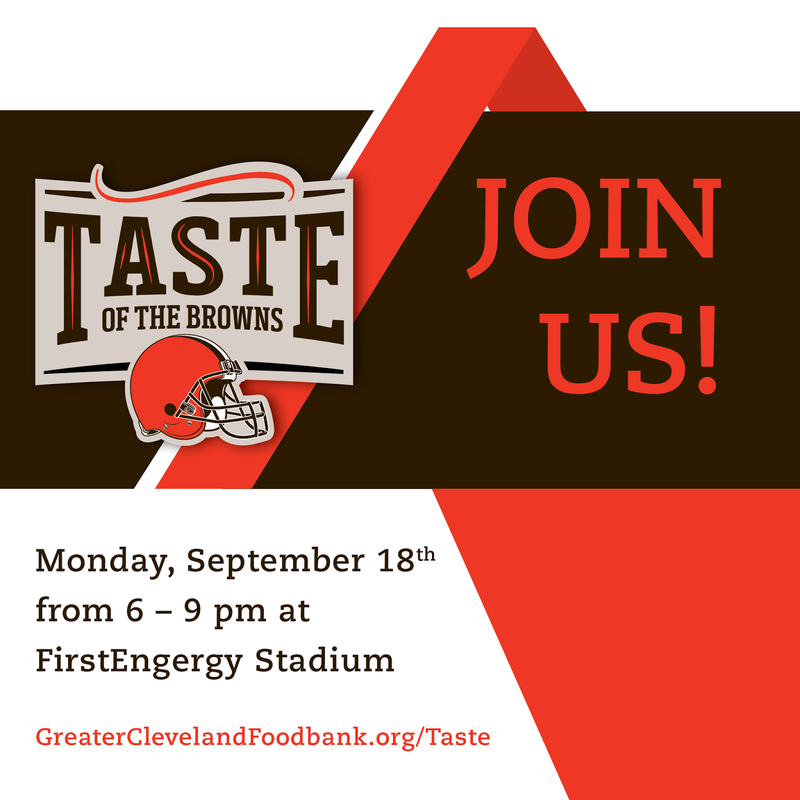 I'm talking about the Greater Cleveland Food Bank's annual Taste of the Browns event at FirstEnergy Stadium on Monday, September 18th. 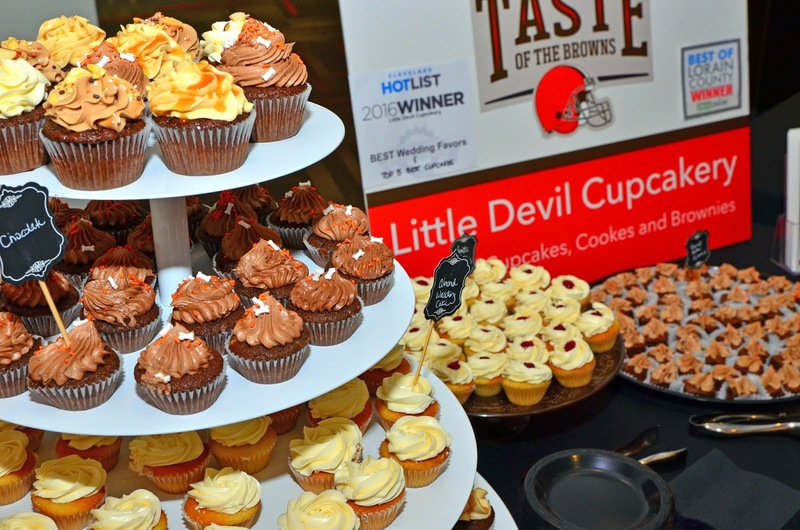 It allows attendees to raise critical funds for our community, while rubbing shoulders with Browns' current and past players, the chance to bid on excellent live and silent auction items, participate in raffles, and sample food from some of the top tier restaurants in our city. This is one event where I always have to pace myself, and can't possibly try everything. This is the 19th annual event. General Admission tickets are $175, and VIP tickets are $250. Or, you could win two General Admission tickets here! Can't attend? You can still donate to support the event, or you can use their mobile silent auction bidding when it opens on September 11th. You don't have to be present to win! We did this when we couldn't attend Market at the Food Bank this year, and still took home a great prize while supporting the organization from afar. But, trust me, this is one fall event that you don't want to miss! Good luck. Disclosure: I was provided with two General Admission tickets to give away and two tickets for myself in exchange for this post. I am a former employee of the Greater Cleveland Food Bank. All opinions stated are 100% my own. After two straight weeks without a day off from work, I was DUE for last weekend. We actually didn't have any commitments, other than I had a massage scheduled at Spa West (heaven), so we decided late in the week that we'd head to Put-in-Bay on Sunday. The Lake Erie islands transport you away from "Ohio" and it's truly relaxing and fun. Just not on a wild Saturday night for me, anymore. Sunday is the perfect day to putz around the island on a golf cart, take in the views, and sip on a chilled glass of wine. After lunch at The Crew's Nest, Mr. H and I headed to the Round House Bar. It's where we met 10 years ago, so of course we don't miss a chance to tip one back in honor. Mad Dog had just come on to the stage, and his raunchy humor, songs, and heckling of the crowd always gives us some good laughs. I didn't want to leave to head home, but those four hours on the island were just the escape I needed. A piece of my heart will always be in PIB, and I love any opportunity we have to scoot up there for an afternoon. I stopped out to CLE Urban Winery last week on Lee Road. They've been open a year now, bringing the area a modern, boutique winery that celebrates all things Cleveland. ...to their Cleveland-themed wine names and labels, it's all things Northeast Ohio here. The space was much larger than it had appeared in pictures on social media. There's a couple of intimate soft-seating areas near the front, a very large bar, bar seating looking into the production room, and additional options scattered throughout the converted garage. I settled in at the main bar for a Flight ($7) of five 1 oz. pours. I tried the Murray Hill Pinot Grigio, Shoreway Viognier, Lake Erie Riesling, Cedar-Lee Chardonnay, and Hometown Heroes Peach Chardonnay. The two that stood out for me were the Pinot Grigio, bright and dry, and the Peach Chardonnay. It was sweeter than I'd usually purchase, but the bold peach flavor was unique and I can picture drinking a chilled glass on these last summer days. I took home a bottle of each. I didn't care for a couple of them as much, but all of them were better than many other local wines, in my opinion. With 12 - 15 different styles, there is something for everyone. Most of their grapes are coming from California, Oregon, Washington, and NY, with some Ohio in there as well. They also have a great space for events. You can bring in your own food, create different seating arrangements, and the rental fee is only $25. Or, you can come in and make your own wine label as a private group with the winemaker himself! I don't find myself in that area often, but this will stay on my radar as a spot to grab a drink before or after dinner. You can also find the wines in several wine retail and local grocery store chains now. 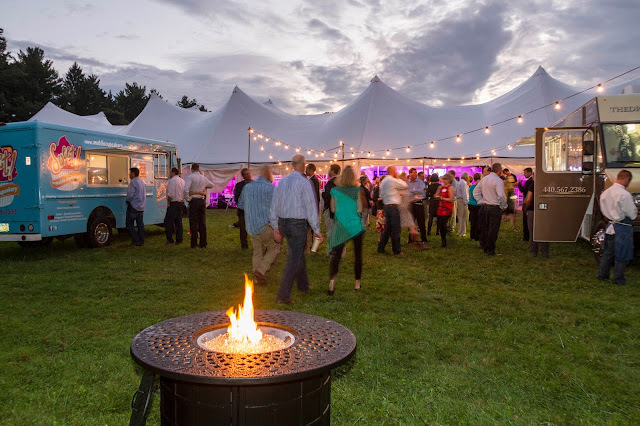 Chefs Unbridled on Saturday, September 16th at the Chagrin Valley Hunt Club Polo Field is Fieldstone Farm Therapeutic Riding Center’s primary annual benefit to raise funds for the programs for people with special needs. Cleveland’s top chefs, led by Scott Kuhn and Chris Hodgson, will prepare a unique tasting dinner under a beautifully decorated tent filled with live music and incredible food. The evening will also include a bourbon tasting bar, horse-drawn carriage rides, a wine pull and an auction. Mr. H and I have had the pleasure of attending for several years now, and besides the fantastic chef lineup each year, something else that stands out is the gorgeous setting. New for 2017, attendees will enjoy the artistry of Natasha Nagawiecki, sponsored by Wahl Professional, as she creates a special scene on a horse during a live clipping demonstration. Every time this event incorporates one of the organization's majestic horses, I get excited! You'll also want to learn about the Golden Ticket. A limited number of “Golden Tickets” are available to purchase ($100 each) for a chance to win a five-course meal prepared exclusively by chefs Kuhn and Hodgson. The dinner includes wine, service and cleanup for 20 guests right in the winner’s home. To purchase (by Sept. 14), contact Maureen Foster at mfoster@fieldstonefarmtrc.com or 440-708-0013 x123. Golden Tickets will NOT be sold at the event. You have a chance to support the organization and win a fabulous prize, without even attending the event. 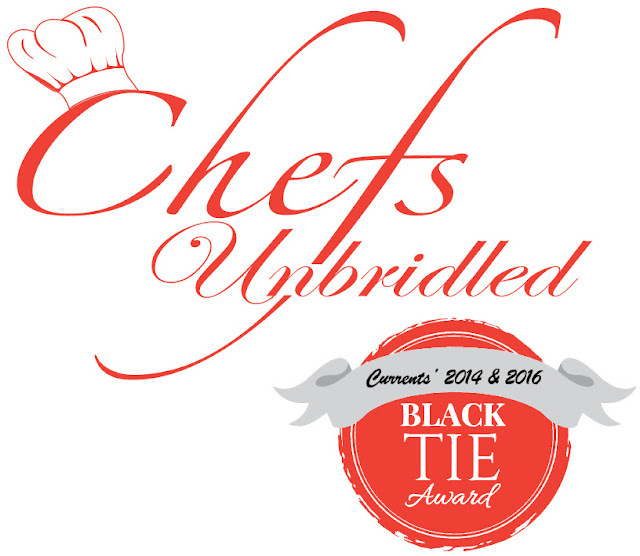 Tickets for Chefs Unbridled begin at $140, and include a tax-deductible donation to Fieldstone Farm Therapeutic Riding Center. Reservations for Chefs Unbridled can be made before Sept. 1; however seating is limited and the event sells out quickly each year. For tickets and details, visit www.fieldstonefarmtrc.com or contact Maureen Foster at 440-708-0013, ext. 123 or mfoster@fieldstonefarmtrc.com. Disclosure: I was provided with two tickets to the event in exchange for a preview and post-event blog posts. All opinions are 100% my own. All images provided by Fieldstone Farm Therapeutic Riding Center. Mr. H and I got to cross a restaurant off of my 2017 To Dine Challenge list...Tinkers Creek Tavern in Walton Hills. That leaves just three more to get to before December ends! A friend had told me to wait until summer to visit this one, because you really want to take advantage of the views and patio seating. I can see why, when this is the view directly next to your table. We did not have a reservation, but on a busy Thursday night the wait was minimal, and they had some outdoor lounge seating available while you waited. We grabbed a drink at the bar and headed out. Once we were seated at our table, we wanted to start with the Sicilian Calamari (noted as one of their signature dishes), but they were out of it. The regular calamari was still being offered, but it wasn't nearly as interesting, so we switched gears. We decided to start with the Spinach Artichoke Dip ($8.95) with toasted pita. Not quite as thick and creamy as I would prefer, but it was indulgent and tasty, so no real complaints here. Mr. H ordered the B.B.Q. Salmon Salad ($11.95), and it was a really pretty bowl of food. Simple, and satisfied his craving for something light. I ordered the Mahi-Mahi Sandwich ($10.95) served on a soft bun with lettuce, tomato, and mango habanero aioli with a side of fries. The fish was cooked just fine, and the vegetable toppings were standard, but I did wish that the aioli was bolder in flavor. There was a sweetness to it if you ate it alone, but both the sweet of the mango and the spice of the habanero were lost once it was on the sandwich. I did ask for a side of it and added more, but that did very little to boost the flavor. It was a fine sandwich, just not as noteworthy as the description made it sound like it would be. All in all, the food was classic American and perfectly acceptable, but you're really going there for the setting and views. I tried the Jalapeno Cilantro, Blackberry, and Mango. All delicious, but I think the Mango ended up being my favorite. Mr. H and I started with the Guacamole Sampler ($15.90) of three. We did the Grilled Pineapple with Bacon and Aji Amarillo, Habanero Jelly, and Classic. The Habanero Jelly was really the only one that stood out, and it wasn't too spicy so don't be intimidated. I went for the Jerk Shrimp Tacos ($14.90) with pan seared shrimp, green papaya slaw, and coconut jerk sauce. All of the tacos are served with three flour tortillas, rice and beans. Honestly, this wasn't very good. The coconut milk overpowered any jerk seasoning, the slaw was served warm with the shrimp so the taco contents had no varying textures. Halfway through our meals, I was asked if I wanted hot sauce. I chose the house hot sauce, and it did help the poor rice and beans. This dish was a big miss for me. Mr. H did enjoy his Salmon En Hoja ($25.90), but I don't think it wowed him either. The views and margaritas were fantastic, and I loved our cheerful server, but the food was only average at best. I think I'll stick to drinks only here for now. The weekend particularly flew by this past one. Not sure why, but Monday came sooner than it felt like it should. We were busy around the house, but still managed to squeeze in some fun. This kicked off with a Block Party at Cleveland Jam in our neighborhood on Friday. It was free to attend. They brought in live music, a food truck, a BBQ food station, and other local craft businesses to set the tone for a laid-back evening on the lawn of their retail location on Schaaf Road. Of course, their shop was open as well, where you could sample and purchase their goods. We picked up the new Raspberry Jalapeno and one of their Tango Mango Habanero. They plan to host two more this summer, on August 25th and September 29th. On Saturday evening, we did one of our favorite "night in" dates by making two appetizers to graze on while we hung out, sipped wine, and enjoyed the front porch. We adapted this recipe for Roasted Pineapple Whipped Ricotta Toast with Sea Salt by adding a touch of honey into the ricotta and by adding prosciutto to the mix. It also needed a bit more salt than the original recipe called for, but once we topped it with some Himalayan pink sea salt, it was quite good. Easy to make, and could rest at room temperature, so it'll be great for parties. Mr. H also started a little food project at home. One that I hope doesn't kill me. He's done a ton of research, purchased all kinds of gadgets, and ordered meat from Pinzone's Market Fresh Meats to...dry age beef in our basement. Fingers crossed. We'll let you know in about a month. We ended the weekend with another little kiddo's birthday party, filled with laughter from the pool, all kinds of snacks, and a stunning birthday cake from Luna Bakery & Cafe. Another good summer weekend on the books!